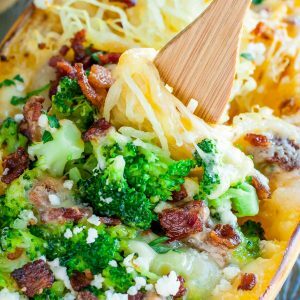 These cheesy Bacon Broccoli Spaghetti Squash are stuffed to the brim with tender broccoli, crispy bacon, and melted cheese. Serve this scrumptious squash up as a side dish or main course! My toddler has a very set distinction between cool and awesome. To her, the two words are complete polar opposites and not to be mixed up under any circumstances. “Momma look!” she’ll yell as she leaps off the tallest piece of furniture she can scale, tumbling into a somersault. “Pretty cool!” I’ll respond, stifling the urge to visibly cringe and wrap my baby in no less than 5 layers of bubble wrap. Nutrition Facts are an estimate gathered using an online recipe nutrition calculator. Adjust as needed + enjoy! 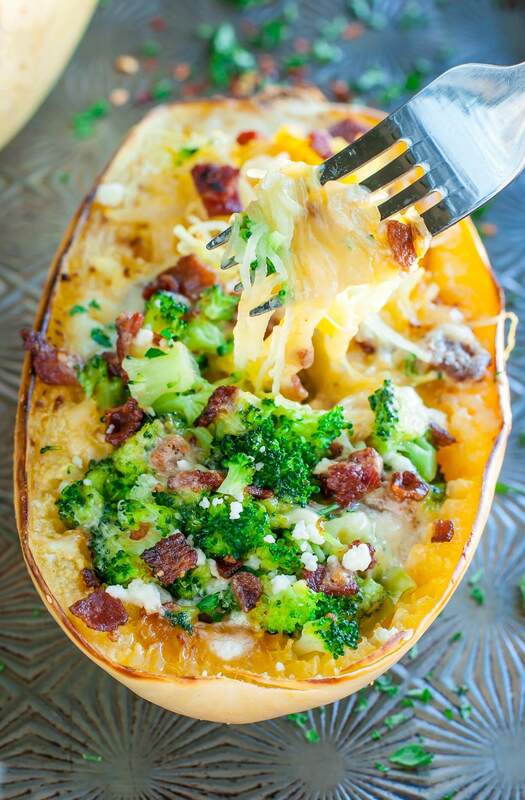 If you get a chance to try this cheesy bacon broccoli spaghetti squash, let me know! You can leave me a comment here (LOVE checking those daily!) or tag @PEASandCRAYONS on Instagram so I can happy dance over your creations. I can’t wait to see what you whip up! vegansaurus chefs: you can totally go in a few different directions to veganize this dish. Make the switch with some tasty fakin’ bacon and your favorite veggie cheese alternative (like Daiya shreds or nutritional yeast) or revamp the dish entirely by adding in extra veggies (spinach and mushrooms are awesome with the broccoli) and your favorite vegan pesto. brontosaurus chefs: skip ze bacon or swap in some vegetarian bacon bits or tempeh bacon. gluten-free? you’re good to go here! 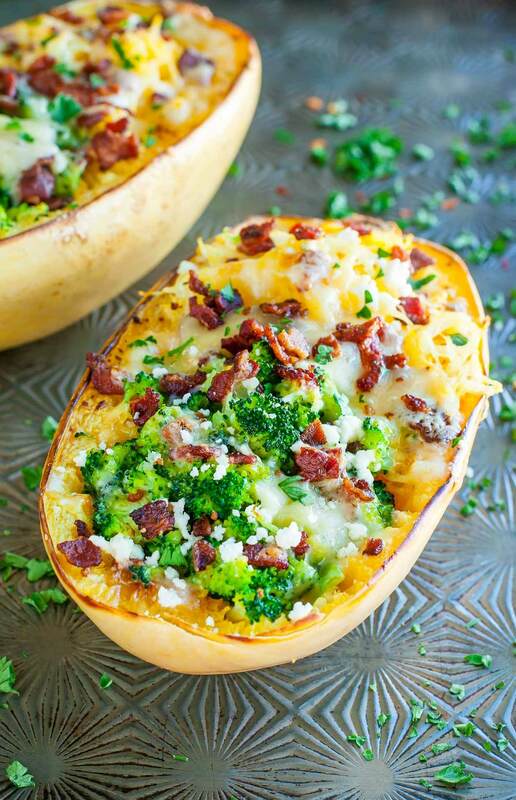 For those of you who are thoroughly team spaghetti squash, keep the stuffed squash streak alive by trying my chicken and veggie pesto, garlic parmesan spinach, and buffalo chicken spaghetti squash recipes. 15 g sugar listed. Cannot find where it comes from. Any suggestions? Very good. Even the meat-loving husband cleaned his plate. Cooked squash, bacon and broccoli the day prior. So grated cheese and conbined, Cooked for about 20 minutes to heat it all. Very enjoyable. You’re an advanced prep master! So glad you guys enjoyed the recipe! Tried this for my first time making spaghetti squash. So simple to make and really good! Added extra bacon and cheese and loved it! Yay!!! So glad you’re loving it Kelsey – Thanks! This tasted so bland until I put a tablespoon of sour cream on top. Yum! Love your idea to add a dollop of sour cream – yum! I have never had spaghetti squash. 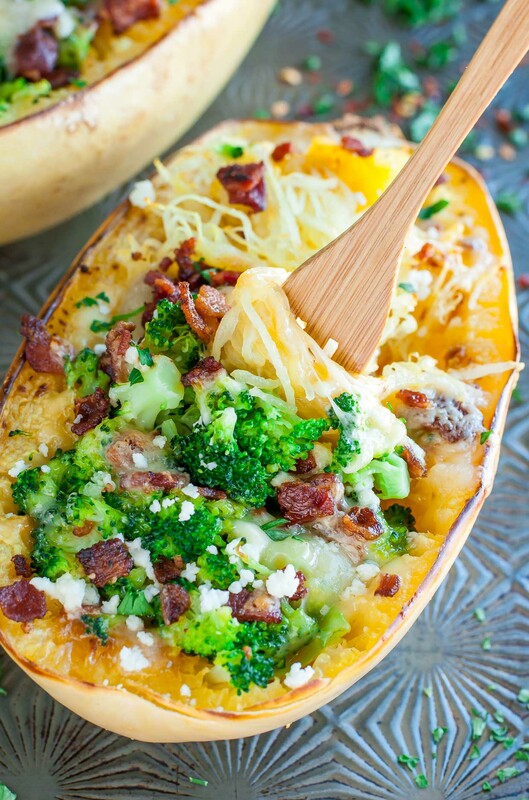 I tried your recipe cheesy bacon broccoli spaghetti squash and was how good it was. This is one recipe I will keep and use again. Totally happy dancing over here! Thanks Debora! Very easy and yummy! This is my third time making it! ?? What do you think about substituting sour cream for yogurt? I just found your website and tried the Parmesan spinach spaghetti squash recipe which was delicious. However, I’m unable to print this recipe and several others I want to try. I get a message that page is no longer available. Any suggestions? I didn’t get the email but I’m printing out recipes right now while I’m cooking the Cheesy garlic Parmesan spinach spaghetti squash recipe AGAIN!! I can’t wait to try the broccoli one next. Thank you so much for the awesome recipes!!! Eek maybe it went to your junk folder? 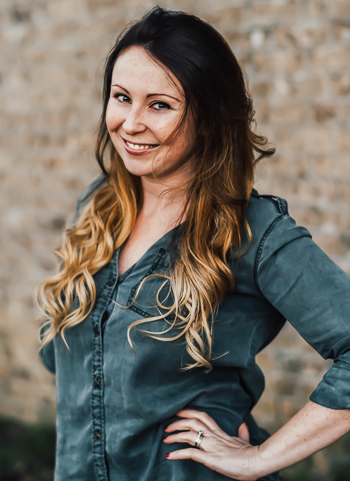 I sent it out right after I wrote ya here – so sorry it didn’t get to you but HOORAY for everything working now and I’m so stoked you’re loving the recipe! <3 Legit makes my day! Thank you Elle! You’re the best! I made this last night and my boyfriend (who’s happy to skip veggies), my 5 year old (who’s iffy on new foods) and I all LOVED it! We ate every last bite! I’d never had or cooked spaghetti squash before, but was so pleased with how delicious, easy and quick it was. I combined this recipe with the spinach cream sauce from your other recipe, and also added smoked turkey sausage. Lots of veggies, protein and some dairy, all in a convenient veggie bowl – amazing! We didn’t miss the traditional pasta. I’m looking forward to making your other recipes. Thanks for being so inspiring! I’m not seeing when to put the bacon in. Would it be step 9, along with the broccoli? Ohmygosh Brittany that sounds like an amazing addition! 🙂 So happy to hear it! I made this tonight for dinner for my husband and myself. The only substitution I made was turkey bacon for pork. This was SO GOOD! I served it with a simply dressed cherry tomato salad, upping the veggie factor even more. Eating this makes me feel 10x healthier and 10 years younger! 🙂 Thanks Jenn! Helloooooooo beautiful! Healthy AND chocked full of bacon? Sign. Me. Up. This is perfection!